Split and scrape vanilla bean. Add to jar along with coconut drink, almond drink, and honey. Stir to combine. Add chia seeds and mix until combined. Cover and refrigerate overnight. Before serving, peel and cube the mango. Purée in a blender until smooth. 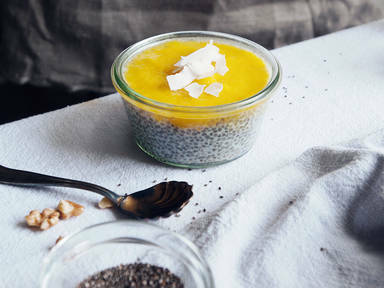 Top chia pudding with mango purée and enjoy!